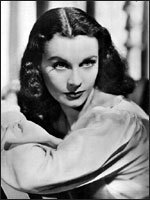 Vivien Leigh (real name Vivian Hartley) was a legendary beauty whose film fame rests largely on her two Oscar-winning US roles: in Gone with the Wind (US, d. Victor Fleming, 1939), for which she was chosen to play the wilful Scarlett O'Hara at the end of the most famous casting search in film history, and in A Streetcar Named Desire (US, d. Elia Kazan, 1951), this time as a faded Southern belle, in a performance of much fragile pathos. Trained at RADA , she always claimed the stage (debut 1935) as her first allegiance, though the jury remained divided about her work in classical drama. She entered films in 1935, getting her first major chance in Fire Over England (d. William K. Howard, 1937), as romantic interest of future husband Laurence Olivier , and then was vivid enough in several late 1930s films of which the best remembered is A Yank at Oxford (d. Jack Conway, 1937), playing a minx who anticipates Scarlett. There were romantic-tragic successes in two US films - Waterloo Bridge (d. Mervyn LeRoy, 1940) and That Hamilton Woman (d. Alexander Korda, 1941) - but her postwar British films saw her unequal to the demands of Caesar and Cleopatra (d. Gabriel Pascal, 1945), Anna Karenina (d. Julien Duvivier, 1948) and The Deep Blue Sea (d. Anatole Litvak, 1955). As her health deteriorated and her wildly over-documented marriage to Olivier broke up, she was poignant in two roles for women of a certain age: The Roman Spring of Mrs Stone (d. José Quintero, 1961) and Ship of Fools (US, d. Stanley Kramer, 1965). Biographies: Vivien Leigh by Anne Edwards (1977); Vivien by Alexander Walker (1987).